It’s difficult to believe but in six months we will again be celebrating Christmas. 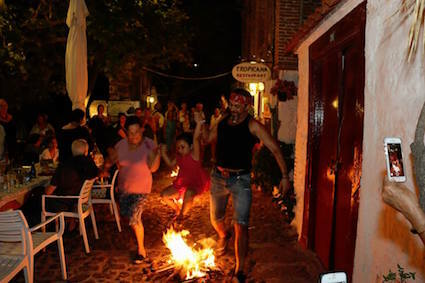 The summer in Greece has hardly begun but bonfires were already ignited to observe midsummer on a date that also marks the name day of John the Baptist. The St. John’s Fires are lit, as the sun reaches it’s highest point in the northern hemisphere. This happens in several countries on the night of June 23 to 24, including here in Greece where the occasion is called Klidonas, a date that has its own interpretation. In former times this was a night when young, unmarried girls hoped that the stars would whisper the name of their future husband. A girl had to go to a spring, fill an urn and carry this so-called ‘silent water’ home (she was not allowed to speak when carrying the water). She and other virgins would place small, much-loved objects into the urn and seal it with a red cloth. Then they would find it a place to wait for the sunrise of June 24, somewhere as close as possible to the stars. That night, so the tradition goes, the girls would dream of the man who would be their husband, helped by several fires lit in the surrounding streets. The following day, a poet or storyteller would retrieve the objects from the urn, one by one, while relating some riddles that would reveal even more about the man the girls had dreamed of. I do not believe that there were a lot of urns on the rooftops of Molyvos hoping that the stars would reveal their secrets this midsummer, because it is only the most sensational part of this tradition, jumping over the fires, that is still practiced. According to tradition, you must put your life at risk by jumping over the flames three times. if you do this, luck will be part of your future life. The practice of jumping the fires may continue, crossing yourself as you pass one of the many churches on the island, or cherishing the amulets against the evil eye may still be practiced, but nowadays nobody takes a lot of interest in predicting the future. That said, now that the Gods of Olympus have lost their credibility, the Greeks continue to worship a very long list of saints, even if it is only occasionally to mark their name day. Churches are scattered all over the island and they are never neglected. Whatever church you visit - tucked away in caves, perched atop mountains or hidden away in the forests - they are always tended with love and devotion. In ancient times, however, it was the oracles that kept order in Greek society and the priests that interpreted those oracles were the most important people in that society. No war or battle would be started, no important decision would be taken without seeking the opinion of an oracle. And, like the words for those unmarried girls, this could be an opinion interpreted in many different ways – perhaps in the form of riddles, or even a poem. Apollo was the god who mainly used oracles to reveal the future, and Delphi was the most important temple from which the secrets of the future were revealed. It was sometimes even referred to as the ‘navel of the world’. But Delphi was only for the rich and the famous. Normal people had to consult more obscure oracles and fortunetellers, who picked the future out of the air by interpreting the flights of the birds, or the whispering of leaves in the trees. It is said that once upon a time there was an oracle on the slopes of the Lepetimnos, where priests defined what roads life would take by watching the flight of the crows. The most famous Lesvorian oracle, however, was Orpheus, the musician who went mad after loosing his wife, driving beautiful nymphs to such distraction that they cut of his head to stop his wailing. But even this did not stop him. His still anguished head washed ashore somewhere near Ancient Andissa, where it was taken to a cave. Orpheus’s distress continued, according to the legend. People from far and wide came to hear his opinion about their lives, and after hearing about this popular oracle, it was Apollo who finally silenced Orpheus. Even today, when I wander on the beaches of Ancient Andissa, I am sure that the wind still sings the words of Orpheus. I would love to climb up to Orpheus’s cave and discover for myself if he secretly continues to whisper wise words about the future. Now that the island (and the rest of Greece) has been hit by a serious heat wave, you have to turn to the wisdom, not of an oracle but that of a meteorologist to predict the weather for the coming days. And while with the benefit of modern science, the weather oracles can speak with confidence about what is in store for us, they too, are not always right. In ancient times when the oracle’s prediction was not to your liking, it was best to blame the interpretation, never the gods. Maybe it would be better if our modern day ‘weather priests’ also spoke in riddles. Then we could believe whatever we wanted.